More new and fun clothing to collect for 2010 and 2011-all seasons. GAME is still producing shirts, but another store NEXT is getting in on the action also. You should be able to find several of the items on this page at Marks & Spencers also. Unfortunately some of the online stores only ship to EU addresses so keep it in mind before you order. Reminder: *Always* check the size before bidding on Ebay, these may range from tiny-kid to regular adult sizes, depending on the maker/where you buy. This long sleeve double tee is similar in style to ones made by TopHeavy in the USA. 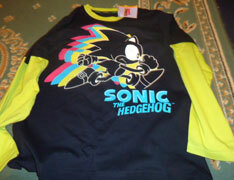 However, this shirt is found at Marks & Spencers. 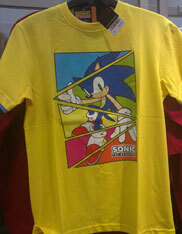 The black shirt with yellow sleeves makes a nice contrast, and the colored after-images to the classic running stock Sonic add interest. With fresh colors and an interesting approach, the art doesn't feel stale. Photographed & owned by Kari. This red double tee is from Tesco. 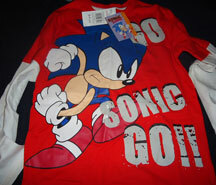 It says "Go Sonic Go" in a blocky textured font, with classic style 'getting ready to run' Sonic as a nice large art. The red surprisingly doesn't really clash with his shoes, and it maintains a classic feel without resorting to 'fake wear' on the design. Photographed & owned by Kari. 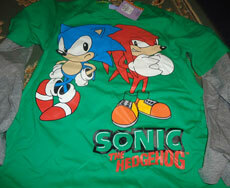 It's interesting to see this classic styled Sonic & Knuckles shirt. It uses some of the updated/seldom-used classic style stock art for both of them, but it makes it look like Sonic may be leaning on Knuckles. For some reason they chose a green background for the shirt, and gray sleeves. It doesn't clash badly or anything, it is just a somewhat unusual color choice. This can be found at Marks & Spencer. Photographed & owned by Kari. One green S & K shirt not enough for you? Here's another! 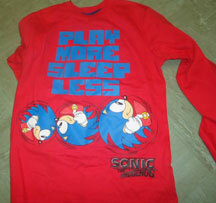 This one uses modern Sonic & Knuckles. 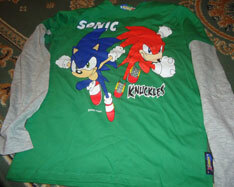 It is done under the Sonic X label, and brings in a new font for Knuckles' name. Both are shown leaping foreward, so this is a more dynamic design. 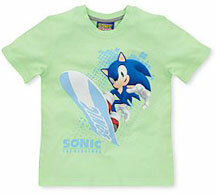 The shirt is the same color (right down to the green/gray sleeve combo) as the one above. This can be found at Marks & Spencer. Photographed & owned by Kari. 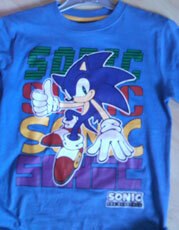 This is a kids size shirt from NEXT. 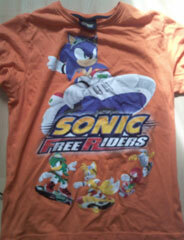 It's got a nice big Free Riders design, with Sonic, Jet, Tails, Knuckles and even Storm Albatross (in the back) on a muted orange fabric. This should be about 12 pound at NEXT in 2011. 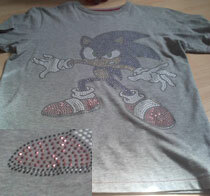 Photo & owned by Shadouge This shirt adds interest to the background, by spelling out "Sonic" in four different fonts with 4 different colors. The effect makes for a decent background with the large modern Sonic. The logo, in black & white is unobtrusive in the corner. 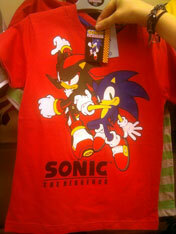 This is in kids sizes only, and should cost about 6 pounds. 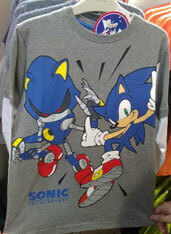 It can be found at Matalan store in summer 2011. Photo & owned by Shadouge. 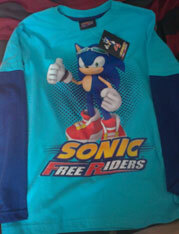 This bright red shirt uses the seldom-used modern 'determined running Sonic' stock art where he looks slightly aggrivated. For effect he has two solid color after-images. 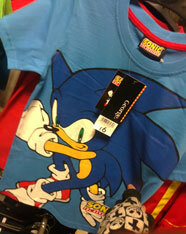 This costs 6 pounds, and is in kids sizes only. 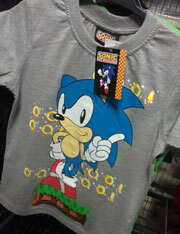 You can find it at ASDA stores in summer 2011. Photo & owned by Shadouge. 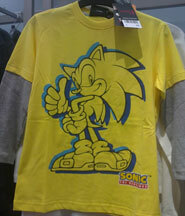 This bright yellow shirt can be found at Debenhams stores in 2011. 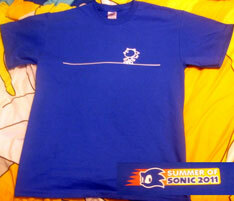 The Sonic art is nice and big, going off all 4 edges of the shirt for effect. 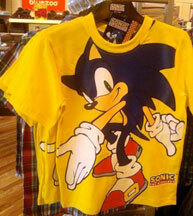 Unfortunately, it's only available in kids sizes. You can see the black & checker tag at the top of the photo. Photo by Shadouge. both halves for a nice effect. 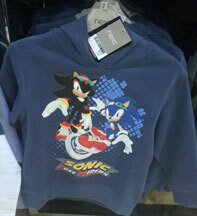 This was at Asda in 2011 in sizes 4- 10. Here is a black tee with 4 square portraits. Each square is a solid color with simple line art of a character's face. 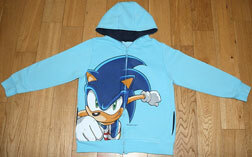 Sonic in blue, Eggman in red, Tails in yellow and...Knuckles in Orange? Why didn't he get the red square? 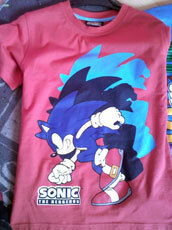 All are classic styled (look at Eggman's giant teeth) & the classic logo appears at the bottom in white. This appeared in Sainsburys' but it isn't known when. 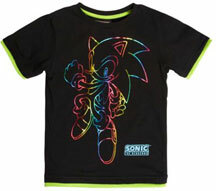 This cool black tee is rather unusual with it's interesting design. 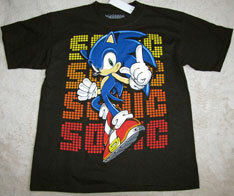 A big modern Sonic graphic seems to jump/hover above "SONIC" written in shades of yellow through red, in dots. But where can you buy this? Write in if you have seen it. 'kicking' the ball. (though it really looks like he was meant to be doing that) This is from 2008.